Wednesday morning in the Sanctuary. This service is led by the Chapelwood Church Children's Ministries Director. The children learn the basic fundamentals of Christianity through stories, songs, dramatics, puppets, and more. Music promotes learning and brain development and can boost social and motor skills. 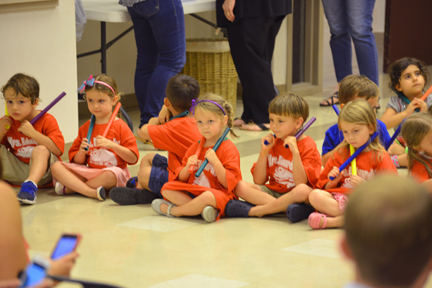 Music Class at Chapelwood is designed to cultivate a love of music and to compliment and expand the children’s natural ability to express themselves. Children naturally respond to rhythm and sound and love to imitate and create music. Above all, music is beautiful, energetic and fun! The infant and toddler classes enjoy familiar songs and finger plays. The repetition of these songs, as well as the introduction of new ones, allows the children to participate by moving and swaying, imitating teacher movements and eventually singing along. Rhythm instruments and puppets are used to hold the children’s attention and expose them to different sounds. 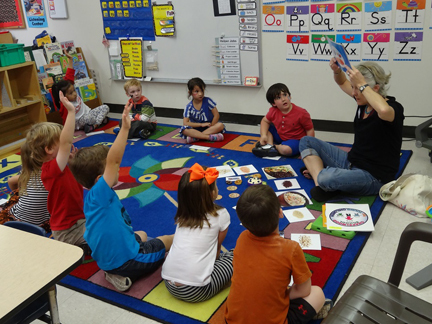 The preschool classes sing along to familiar songs, play rhythm instruments, dance, play music games and listen to stories. The older children learn to count and play in rhythm and are exposed to the language of music. Instrument families are explored, and traditional orchestral and band instruments are demonstrated. Motor class is challenging children with entertaining activities that are developmental movement games of perception. Motor development relates to self-esteem and one's feelings about himself and his/her skills. A high level of self-esteem for our students is a top priority! It is a well-known fact that children learn and remember most when they are actively and physically involved in a learning situation. What this means is that we often learn best by DOING. Most perceptual motor games follow a rather precise sequence. Children need practice following this prescribed sequence and trying out all of the steps, not just the ones that they might choose. Perceptual motor game time is the time when children learn some specific skills in prescribed ways. 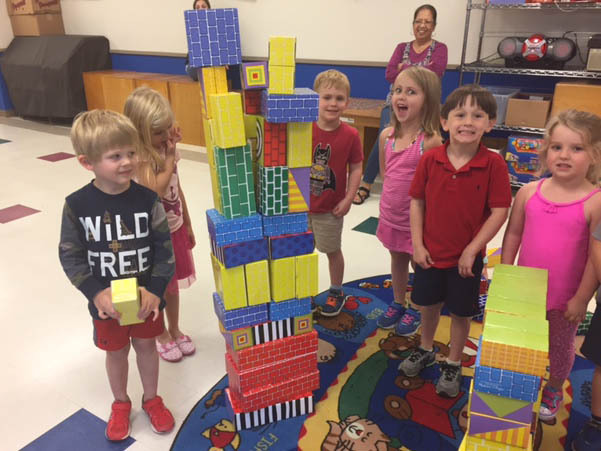 At the same time, there are opportunities for imagination and creative expressions. Science: We are learning new concepts, testing ideas, planning, observing, predicting, comparing, drawing conclusions, and discovering how things work. Health/ Nutrition: Designed to cultivate healthy eating and physical acitvity habits. Teaching Science skills like physical, life, and earth science, along with STEM activities, kids are able to answer various questions we ask out of curiosity. For instance, how does it rain? How does our body function? By introducing basic nutrition and health facts at a young age, children lay down a foundation of knowledge and gain a positive approach to food and activity. ¿Como estas? How are you? To introduce children to the joys of planting, tending and harvesting a garden.